My oh my, let me tell you how fabulous it is being married! The wedding day was such a roller coaster of emotions, but it ended so perfectly. It seriously was all just a dream come true, I could not wipe that smile off my face! I even got excited when snow started to fall to close down the party! I hoped you enjoyed these teaser images courtesy of my friend Holly and my Uncle Jerry! I need to do some serious shout-outs to some incredible people who made the day so special! The gorgeous dresses were all made by my talented dressmaker step-mother, Diana Winget Olson. I felt absolutely, positively beautiful in mine, I just didn’t want to take it off! The day-saving Brett Dorrian was responsible for all of our hair and makeup, and was a total angel to work with. The breathtaking arrangements were created by the ever-so-sweet and brilliant Ashley Fox Designs, who was a huge help to us the entire process. You can see a little bit of the pom-pom decorations…my friend Kim Yeager of Lark Nest Design was responsible for that! 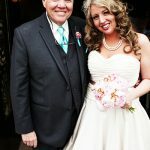 My stunning pearl necklace and earrings were designed by Jen of JWP Jewelry Designs and birdcage veil by Ann Leslie Designs. Sooo pretty. 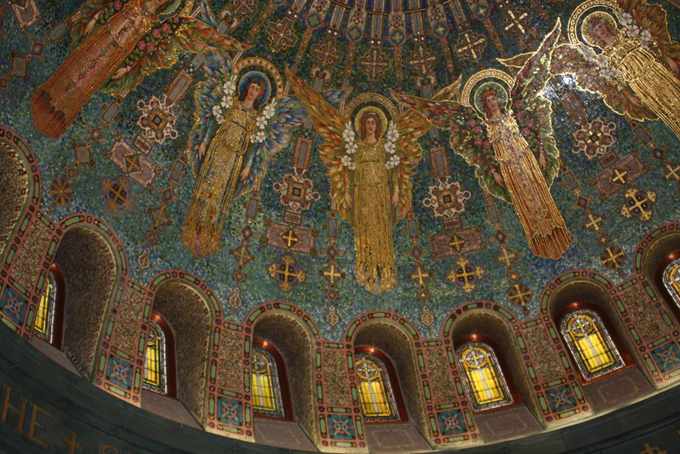 The service was held at the Lakewood Memorial Chapel (the mosaic is INCREDIBLE there!) and reception at Saint Anthony Main Event Centre, catered by 3 Sons Signature Cuisine. Best food ever, everyone agreed. They baked that amazing cake as well (it was super yummy too!) and Ashley decorated it with her flowers. LOVE it!!! I’m going to have a busy week preparing for our honeymoon. We’re off to an unbelievable resort in Playa Del Carmen, Mexico this weekend. Two full weeks of wedded bliss and turquoise waters….it doesn’t get better than that! Edit: Our incredible photographer Spencer Combs just sent us a teaser photo….breathtaking!! I had to add it to show you guys! 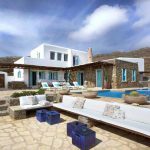 Mykonos Panormos Villas + Fun News! God bless you! 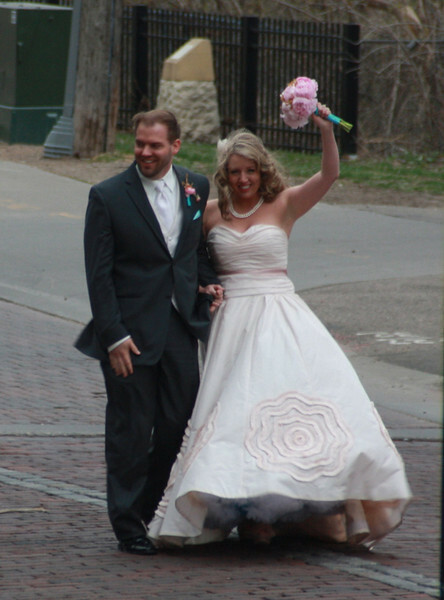 My wedding day was a roller coaster of emotions as well… and how nice is that! Being married (with the right person) is awsome. I just loved the tourquoise details!!! And you were looking so happy and lovely! you look like a perfect loving couple, and that last pic looks priceless, you two look so in love in that pic. You look beautiful and so happy! Love that dress! Congratulations and best wishes. I'm sooooo speechless! OMG! You were SO BEAUTIFUL!!!!!! Your dress!!!!!!!!! WOW, Erin!!!! I'm loving these pictures! You guys look so happy, so in love! Have fun together, enjoy your honeymoon, enjoy your whole life together! I'm so glad you're happy… you deserve it so much, Erin. GORGEOUS!! 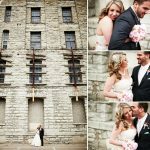 Wow these pictures are stunning..and you made one beautiful bride..Kates got nothing on you:) Love the turquoise bridesmaids dresses too..how fitting. Looks like an amazing day indeed…wishing you both a lifetime of happy days, smiles and laughter together. I've never left a comment but have been following your blog for a while. Congratulations on your wedding, you were a beautiful bride! Can't wait to see more pics! You look gorgeous and radiant, surrounded by so much love! I'm so happy for you, your new husband and all your family and friends, who look so happy for you both! Have a great honeymoon! PdC is a fun place. Congratulations! I LOVE your dress. The flower trim is so beautiful, unique, and WOW. Enjoy your honeymoon. Congratulations!You looked amazing. Enjoy your honeymoon!! I hope you two have a very happy and amazing life together. 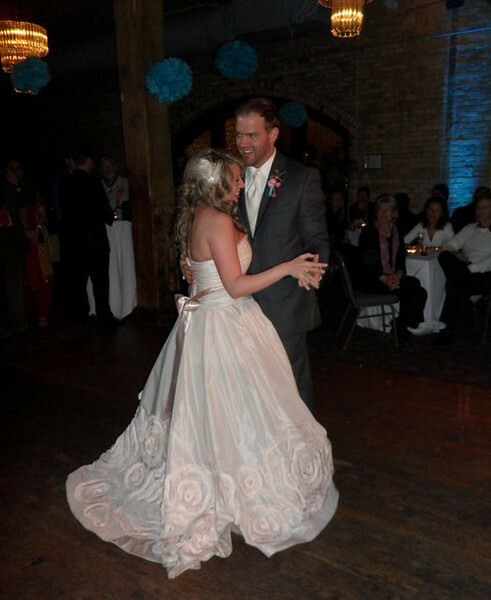 Your dress was so beautiful, and so were you. 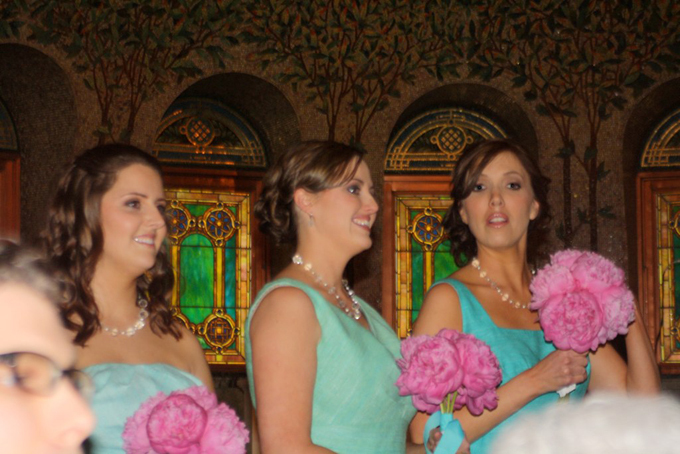 The bridesmaids wearing turquoise, that idea was so cool. Congratulations, your dress is so pretty. You looked beautiful, and your husband looked so handsome. GORGEOUS girl!! I LOVE your dress. I cannot wait to see more pictures!! Have fun in Mexeeco!! SO beautiful! I loved everything from the cake to the flowers to the bridesmaid's dresses and the show stopper–your DRESS! Congrats again!! Congratulations! You both look unbelievably happy and in love. Congratulations Erin and to your new hubby. The dresses were made by your step-mom? Wow she is one talented lady! You looked beautiful, the dress was stunning and unique, can't wait to see more. Take a break and enjoy your honeymoon. Congrats sweet girl! You looked stunning!! AWWWW, you look so pretty! Love the dress, your colors, so nice!!!! all I can say is Beautiful … you, your dress, the bridesmaids … c'est parfait! Congratulations to you both, wishing you much love and happiness. Aww, congratulations! You looked fabulous! You are a gorgeous bride and your groom is quite handsome! Lucky you two to spend the rest of your lives together! Much happiness…I loved the pics..
please show us some more! You are soooo beautiful and radiant!!! What wonderful photos!!! I wish you both tons of happiness!!! CONGRATS!!! You looked absolutely gorgeous! I can't wait to see more of all the pink and turquoise! Have fun on your honeymoon! Of course I love all of the turquoise and aqua, but the peonies?! And I think I have that cake pinned. 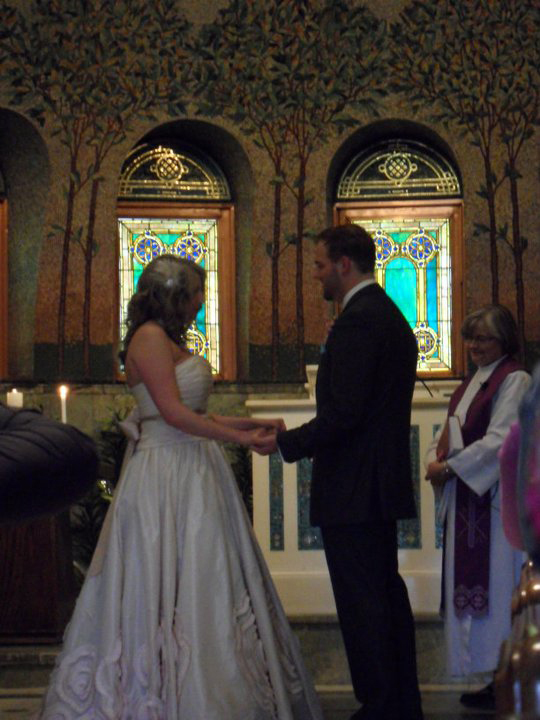 The church was just beautiful, as were you and your man. May that smile stay with you always and forever,and many Congratulations to you both. Congratulations to the both of you! You looked absolutely gorgeous and radiant, Erin! Your wedding was beautiful. And, those peonies!! Have a wonderful honeymoon! Love your pictures, you look so happy! Such a beautiful venue too! Congratulations…you look absolutely gorgeous. 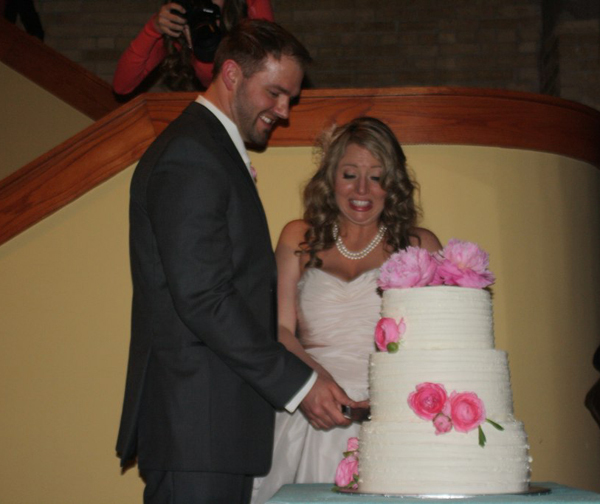 I adore your bouquet and wedding cake….so beautifl!! All the best for a happy future!! Congratulations! You look stunning. Really beautiful. I love the colors- I had the same at my wedding. Breathless. You are so beautiful, and your dress is gorgious and chique. Handsome hushband…you are a lovely couple. Did I see a touch of turquoise…. Gorgeous! I can't wait to see more! I want to get married again so I can have a turquoise wedding 🙂 To the same man of course. CONGRATULATIONS!!!! What can I say? Gorgeous bride, gorgeous husband, gorgeous wedding! Oh, it looks like it was the perfect day for you! 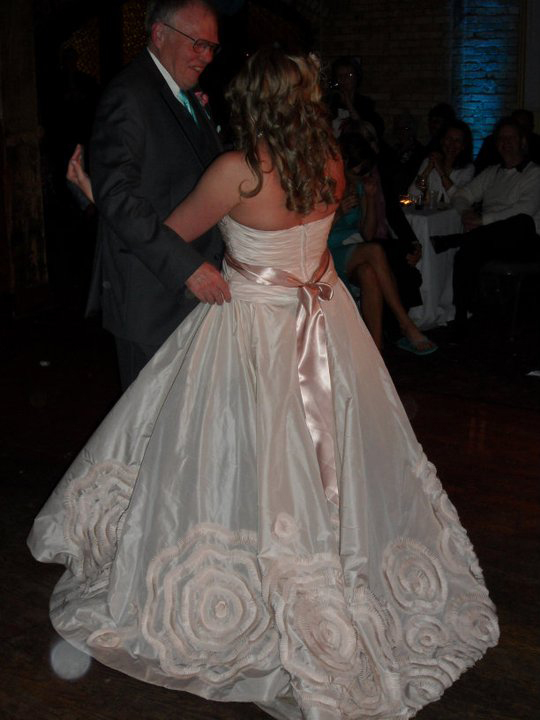 I DID notice your beautiful satin sash down the back on your beautiful dress! And I noticed your pretty "turquoise" hanging flowers and the spinners outside the church!! Everything looked wonderful, I am so happy for you. Enjoy your honeymoon!! Congratulations again to a lovely couple! Congrats! You are are gorgeous couple! Love your dress! Many Blessings for a long and prosperous marriage! Congratulations! I am in awe of your dress and how talented your step mother is! Can't wait ot see more! Congratulations Erin. I'm so happy for you and… I'm speechless. I'm just so happy for you and that you enjoyed the day so fully and completely (turquiosy). Have a wonderful honeymoon! lots of love and happiness!! ahhhhhh !! erin!!! felicitaciones!!!! beautifull you! your husband!! the weding! your dress! the beautifull tourquoise ladys!!! !lots and more and more love to your life!!!besos!!!! Congratulations! You look beautiful and I love the photos. 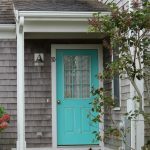 Love how you incorporated the turquoise (obviously!). 🙂 I am a subscriber to your blog and enjoy seeing it come in everyday, I have never commented but I couldn't resist telling you congrats and while I'm here writing–thanks for the great, inspirational blog…it's so fun to see your posts and various pictures. Congrats again and have a fabulous honeymoon! congratulations! i wish you and your beloved much happiness always. You look absolutely gorgeous! Love your dress and of course, all the turquoise! Congrats!! OMG those pictures are AWESOME! My first thoughts when I saw the chapel was "She picked that place because of the turquoise!" and "Only Erin could find a place to get married that actually is in her color family!" Your dress is GORGEOUS, your step-mom is UBER talented. Everything turned out so beautiful, you look breathtaking! You are such a pretty couple, Chris is so darned cute. You both look so happy, you are just GLOWING! I am sure the water where you are going will be beautiful turquoise as well. Please post pics when you can, I will take a vicarious vacation through your photos. Congrats! You look gorgeous! Love your dress! Beautiful photos. Love the dress and the cake. Hope you have a fantastic honeymoon. Congratulations! You look so beautiful. I am in love with the peony bouquets! You look absolutely amazing and stunning. Congratulations! Erin!!! congratulations!!! you look so beautiful and your wedding dress is gorgeous! the braidsmaid dresses turquoise! of course and the bouquets! love everything! you look so happy! being married is great! I tell you by experience! Congratulations!!! You looked absolutely gorgeous- I just loved your headpiece and dress!! congratulations! 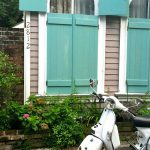 I have been reading your blog for a long time- first time commenter. Your wedding looks beautiful and you were a lovely bride! I hope you enjoy many years of happiness. As a hobby dressmaker, I must comment on spectacular work by your stepmother. Thanks for providing a link to her website. Very professional and impressive. again, congratulations to you and your new husband!! Thank you for sharing your photos. Just beautiful!! Your dress was divine. Love the flowers too. Have a wonderful holiday. Erin, I'm yelling and hopping up and down!!! Everything looked amazing but especially the light in your eyes. Congratulations and have a wonderful honeymoon. As one who was there, I can attest that the dress was beautiful!!! worth all the work. nice to see a few pictures, even one with me :). Congrats Erin! You looked stunning!! Congratulations, gorgeous! I love the peonies!! My absolute favorite!! God bless you and your new husband! What a GORGEOUS COUPLE! Very BEST WISHES and live happily ever after! Congrats! I love the turquoise and pink! Felicidades Erin!! Estas Hermosa… que sean muy felices!! 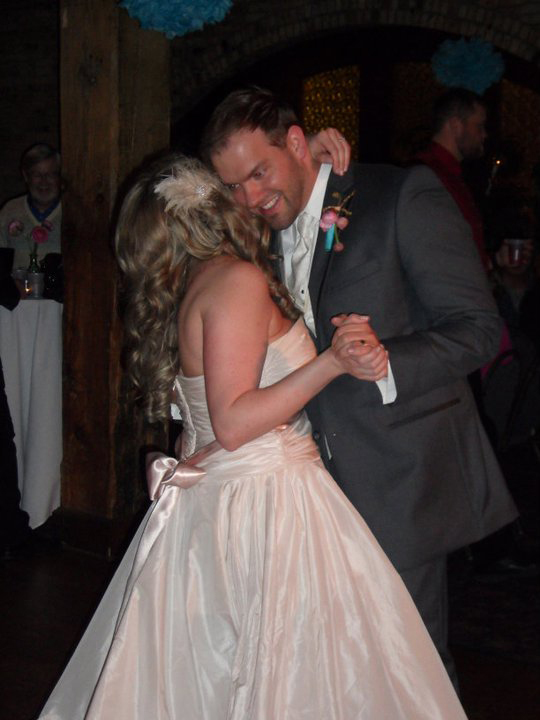 You look so beautiful and happy (the hubs is not too shabby either!) Congrats and have fun on your honeymoon. I was just thinking today that I can't wait to see some wedding pictures! Funny because I don't even know you, but I feel like I do:) You looked beautiful. Have a great honeymoon!!! Congrats Erin!!! You look so LOVELY! 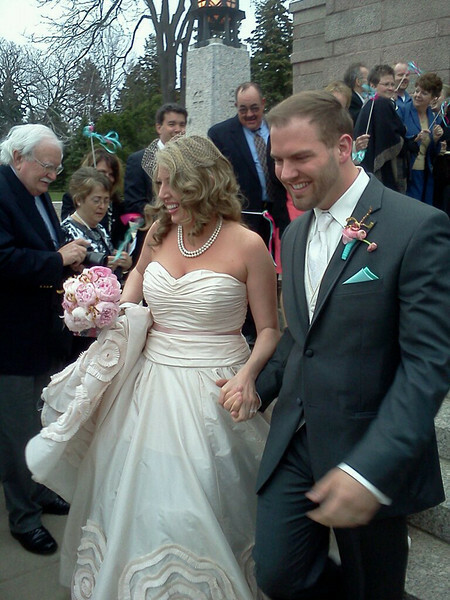 Loved your dress, and the turquoise details… of course!!! Such a BEAUTIFUL wedding, Erin 🙂 You both look so much in love. *Gush* at all the gorgeous details ,especially at how stunning you looked and how dashingly handsome your new hubby looked. Many congratulations and all the best wishes for a magical life full of so much love! 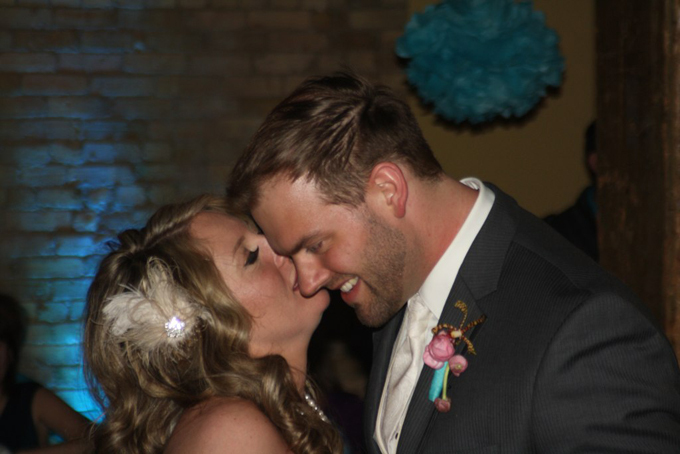 Stunning bride, handsome groom….congratulations! The turquoise and pink combo is yummy. I even love you little turquoise touches on the corsages! The chapel is breathtaking too. Can't wait to see more photos!!! Oh my my lovely wedding gown, lovely everything! Simply divine…everyone looks so happy and having a wonderful time. Many blessings to you both! So absolutely stunning. Looks like you really did have a great time. Oh so beautiful! Everything was absolutely lovely. I know you will cherish the pictures and memories. Congratulations – you look beautiful! Thank you so much for sharing these lovely photos. Gorgeous! Congratulations Erin! Wishing you a very happily married life. 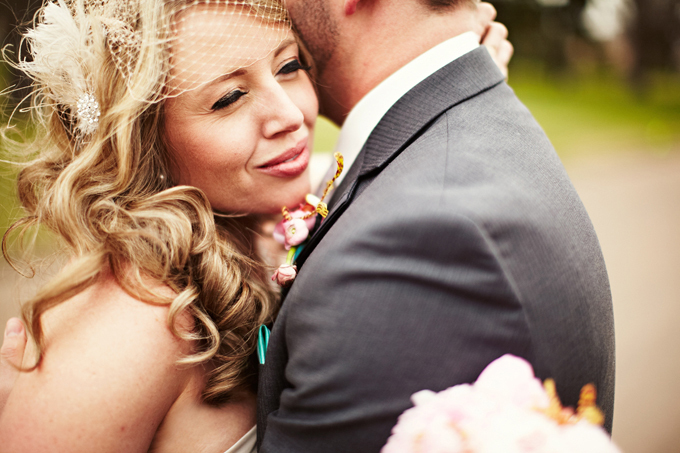 Looks like you had a beautiful wedding and of course I loved everything turquoise! Woo hoo! Wishing you love, happiness and joy and every good thing for a lifetime shared together! Your gown was amazing! You look absolutely beautiful, and your man – so handsome! Love those giant roses on the gown, the ribbon, the flowers, the cake … and most of all the way you two glow with such happiness. woo hoo! Congratulations Erin! These pictures and your dress are beautiful, can't wait to see more!! You got married on my son's 25th birthday. April 15th is a lucky day. Everything was beautiful! WOW! And, I love the top pic! I can't wait to see the rest! Congrats, Erin! What unique and gorgeous tables and such a fabulous dress! Amazing! HUGE Congrats Erin. You looked absolutely stunning and so very happy. Hooray!!! The Church ceiling is amazing, truly beautiful and uplifting. I love your dress, it reminds me of Jacqueline Kennedy's when she married JFK, so gorgeous. congrats. you look absolutely breathtaking! can't wait to see more photos. We are all so happy for you.Wishing you the best. Congratulations both! Is was a wonderful weeding, thank you for share de pictures! 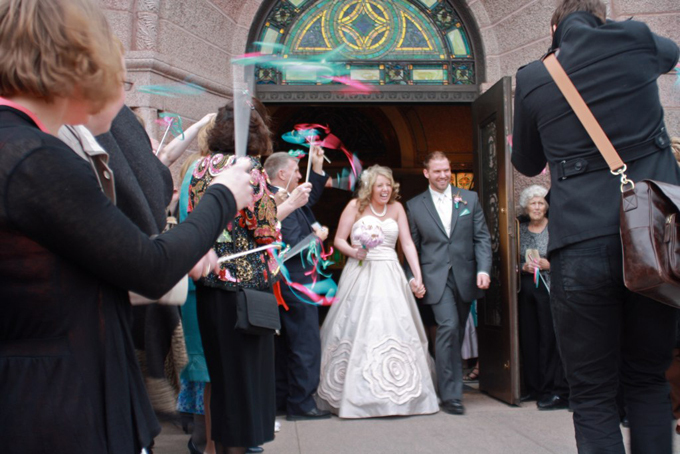 You were a beautiful bride and your pink and teal details were amazeballs! Beautiful wedding! You looked gorgeous and so happy! Congratulations! All the best for a happy future!! Congratulations Erin! You look simply stunning (you have that beautiful bride glow) and I just love what details we've seen so far! Wish you two the best! Congratulations ~ Beautiful!! Best wishes on your first year!